has a package to suit all your special occasions. Please note all pricing is for a professional level of service & we do not lower our standards by offering cheap discounts. When comparing with competitiors we have one of the best photo booths on the Sunshine Coast with the largest range of props included. Unlimited photos within hire time, Enjoy it all night. Your guests can choose colour, black and white or sepia photos. Choose 1 of up to 5 photo print layouts emailed to you after booking has been made. Attendant can place a magnet on the back of the strip so your guests can keep a memento of your occasion on fridge. 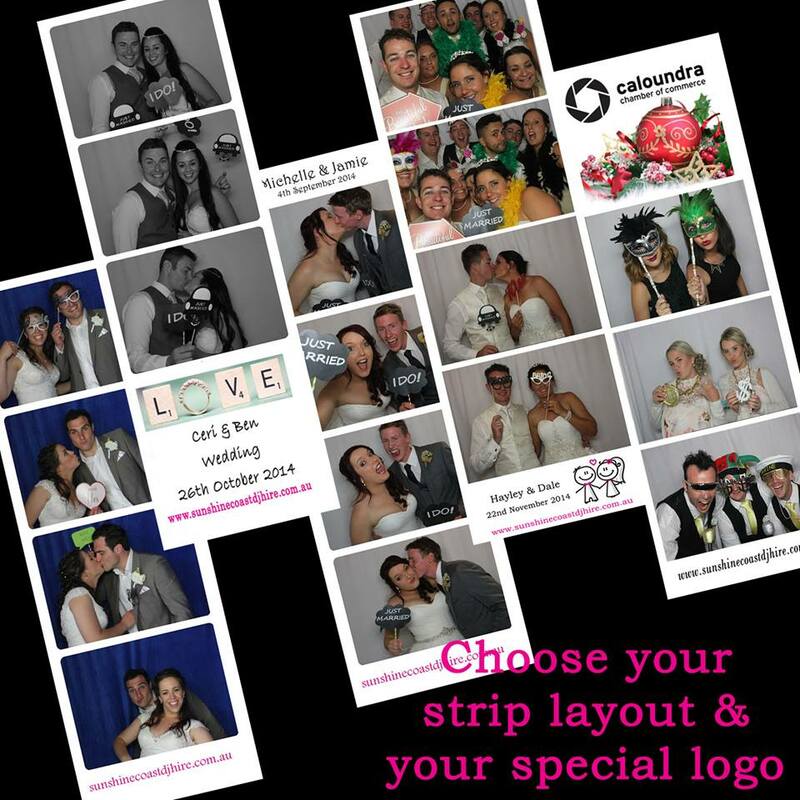 Unique Logo / Graphic – Each photo strip is customised to reflect your details, event or personal message. Give your guests the ultimate experience and leave a lasting memory of your event. Photo booth attendant during the entire hire time. 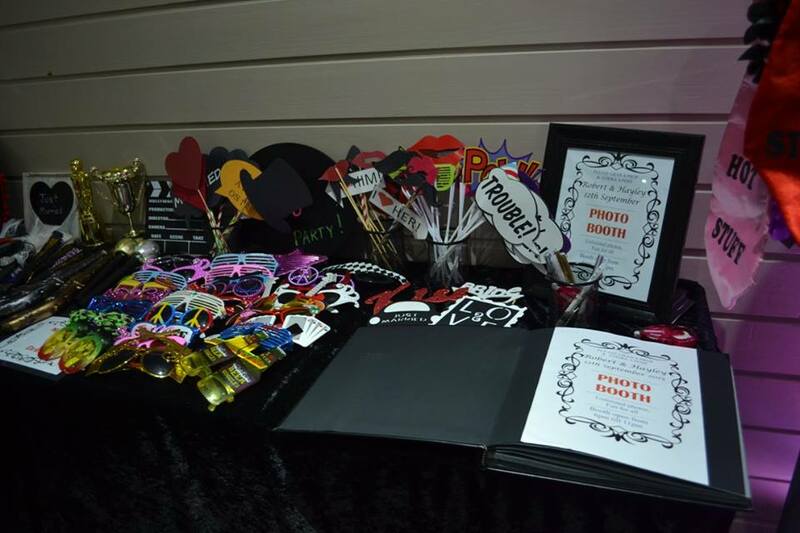 A prop box full of a huge selection of novelty, hats, glasses, masks, party signs, feather boas all displayed out on a table for easy access, A small blackboard for your own message & so much more (special wedding signs & props box also avalable for all wedding bookings at no extra cost) IF a props box is not required for your event please advise at time of booking. Black Photo album (very good quality) with gold and silver metallic pen and double sided tape. Depending on which photo strip option you choose the guests will keep one and place the other in your album with a special message. Extra wedding props to enhance you special day for wedding bookings. Please Note: you cannot choose both the Gold & Platinum option. You must choose one or the other. * PLEASE CONTACT US BEFORE BOOKING IF YOU NEED OUR PHOTO BOOTH TO BE TAKEN UP ANY STAIRS, IS OUT DOORS OR HAS DIFFICULT ACCESS. Please Note: All public holiday surcharges will be invoiced separately after booking has been made. Please Note: A meal is to be provided to the Photo Booth operator to all evening bookings regardless of time & all day bookings over 4 hours. Please see FAQ for more detailed information & explanation why. Please Note: Any parking, ferry, toll or similar fees are billed extra on a separate invoice to the booking. All packages pricing & services on Christmas Eve, New Years Eve will occur a surcharge & special conditions. Please contact us first before proceeding with a booking during this time period! 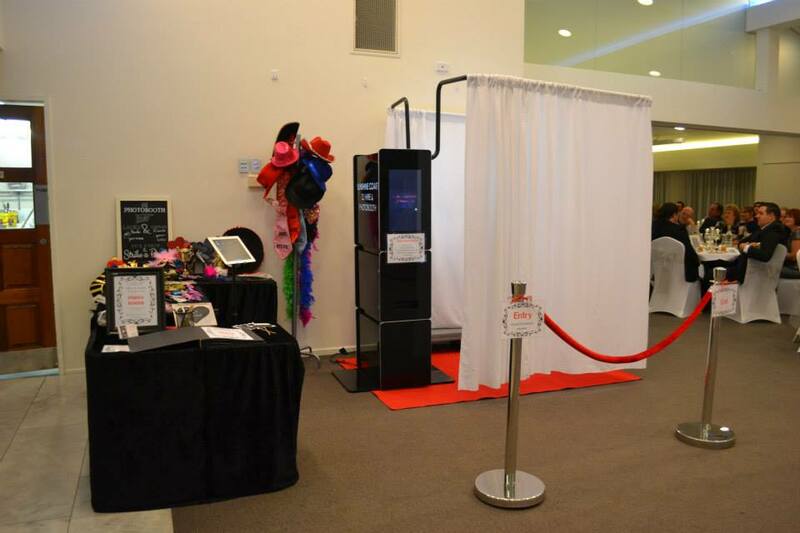 Props enhance your guest’s photo booth experience and encourage their creativity that’s just waiting to be unbleached. We will provide a prop box is stuffed full of novelty items including hats, big glasses, masks, feather boas, the list go on. We reserve the right to remove the prop box from use, if we believe they are being mistreated and/or deliberately broken. Our Prop Box is one of the largest supplied and takes up more than 2 tables full of props. Our amazing Canon 15 megapixel DSLR camera and Mitsubishi Dye Sublimation printer produce superior quality photos that are sharp and vibrant. With the choice of black & white or colour, your guests won’t be disappointed. Depending on photo strip layout option chosen it can print out two identical photo strips. You are given the choice of 6 different photo layouts to choose from for your event. Three have a double print out while the other three have a single larger postcard size printout. We will provide a professional photo album. We will also provide high quality gold and silver pens for your guests to write comments. Guests will place one copy of their photo in the album and write a message to accompany the image. This album will leave an everlasting photographic memory of your special event. Your choice of backdrop options white, red & royal blue (new) backdrop curtain. (white is most common option & recommended for weddings). Each photo is customized to reflect your details or personal message. Give your guests the ultimate experience and leaving a lasting memory of your event. Your guests will love our messaging option; guests can leave a personal video message up to 30 seconds in length. Video messages create a lasting memory of your event. Disclaimer* Please note while this is a free service we offer it is conditional of our pre paid Telsta wireless internet getting sufficent & suitable Telsta coverage from your location or inside your venue. We will not fully know or can guarantee that this will work 100% until after we have set up & tested upon arrival. If internet signal is weak or constantly drops out we are unable to offer this service. Kindly note as it is a free add on we offer to you then no financial loss can be offered or requested. It does not affect the normal operation of the photo booth that you have paid for.